Maria Mikhaylenko was awarded with the Frontier Award, during the Decade Of Women Reception on July 10, in London. 5th Element Group and Decade Of Women hosted a reception on the evening of July 10 to honor the winners of the London #HackQuantum challenge, and to deliver two prestigious awards: the Frontier Woman Award and the Quantum Impact Award. 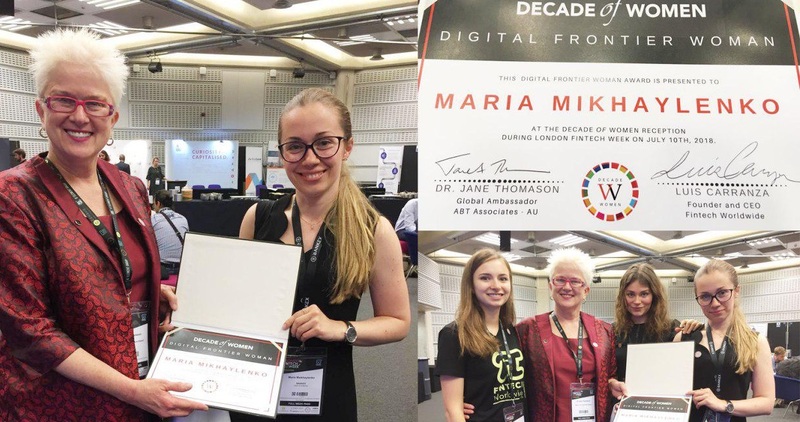 Maria Mikhaylenko, a product lead of Open Charity at BANKEX, an analytic, with 8 years of experience in risk management MSc, Mathematics & Computer Science Professional and the winner of the international hackaton 2017 – judged by Vitalik Buterin, was awarded with the Frontier Woman Award. “We would not be who we are without their contribution. Even though this award is about “transforming women’s lives,” it is really the women at BANKEX who are helping us (BANKEX) develop and market blockchain solutions for the transformation of the 21st century capital markets,” he added. “I believe, there is a lot of power in a collaborative community. The Decade of Women award is a recognition of our ability to create these powerful communities and achieve synergy among women not only by advancing our careers in tech, but by simply advancing tech”, said Maria during her speech. Maria reminded that blockchain is a technology built to realize trust, but it is also built on trust. The Decade of Women is a network of creative, hardworking and influential women from different industries and professional areas collaborating with a shared vision, realizing milestones within the community and establishing the presence of women in tech, which is actually number 5 Sustainable goal for gender equity. “This community, with a shared vision for both quality and equality, is much more effective than a standalone organization fighting to be heard just because we are women. We are not just voices that need to be heard – we are contributors and leaders with ideas that matter. We’re here to stay!”, reiterated Maria. Maria also announced an educational program for women organized by BANKEX and invited women from all over the world to take part in this program. After going back to their countries, they can share their new experiences, skills and abilities, and thus enlarge the collaborative community. “I am happy to launch an educational program for women by the Decade Of Women & BANKEX and invite women, who would like to understand how to work and succeed in this area and how to make effective business in the blockchain industry,” Maria said. 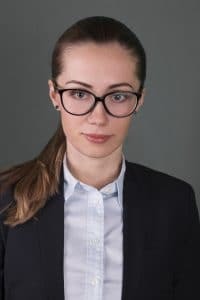 Maria emphasized the transformative power of blockchain technology and recognized that she has seen more women in tech in the blockchain sphere than any other – both as programmers and CEOs. For Maria it’s a new world of international collaboration that has the potential to reset the nature of collaboration between men & women. “Blockchain is so new that we can’t always be too picky about where talent comes from and at BANKEX, I’m proud to say, there is a great mix of men and women based on the idea that talent needs to be nurtured wherever it is, and so that’s what we’re doing. We’re engaging women in tech because the talent is there and we need it for all of our products,” underlined Maria. London Fintech Week which takes place July 9-13, brings together 5,000 leading fintech thinkers throughout the week from around the globe to engage in one of the world’s leading financial services ecosystems. Sponsored by 5th Element Group and the Decade Of Women, London Fintech Week featured 40 international companies exhibiting over the course of the week, with each day dedicated to a different theme including Fintech Disruptors, Capital Markets and Wealthtech, Blockchain and Crypto-Finance, and Investor ICOs and Start-ups. This event provides an opportunity to celebrate the progress of both women and men, and to provide a means for the promotion of gender equality within the fintech industry. The Decade Of Women was launched with two powerful inaugural events in New York co-hosted by Thomson Reuters and 5th Element Group. The first, a private reception held at the United Nations, where a high level group of over 170 global leaders announced the elevation of the International Day of Women into the launch of The Decade Of Women solutions and action campaign – dedicated to Completing the Equity Revolution. Celebrated across eight billboards in Times Square and now live at DecadeOfWomen.org, The Decade Of Women is bringing forth a #WeUniteWe Pledge as part of a decade long series of bold commitments to Celebrate, Unite and Exponentiate the progress of both women and men to get to complete the gender equity revolution, and to realize UN Sustainable Development Goal #5 to achieve gender equality and empower all women and girls by 2030. As cryptocurrency and blockchain continue to garner interest, and it is clear that we are only at the beginning of what looks set to be a compelling story, regardless of gender. With that comes much excitement.